Need to work online while in Chiang Mai? We have free wireless internet throughout the guesthouse for those with their own laptop. Chiang Mai budget guest house! 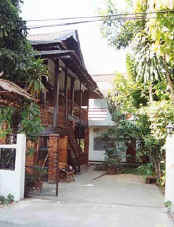 We have a quiet central location in Chiang Mai with budget priced rooms. Press "Ctrl + D" to bookmark this site. 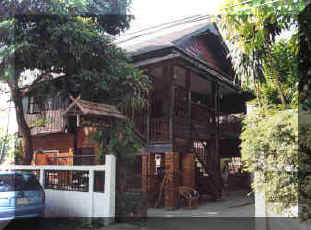 Chiang Mai budget backpacker guest house accommodation in the centre of Chiang Mai. Safe for single travellers and only a short walk to the main streets of the city. Sarah Guest House was established in 1988 in Chiang Mai Thailand and is recommended in such guide books as - The Rough Guide, Footprint, Lonely Planet, Frommer's, Let's Go and many other guidebooks. Sarah Guest House has been open in Chiang Mai since 1988, operating from the same location and run by the same owner/manager. At least 50% of our guests are repeat visitors or recommended by friends. The guesthouse provides clean & safe accommodation for the budget traveller. We have fan rooms for approx. US$10/night and A/C rooms for approx. US$15/night. We are in one of the best locations in Chiang Mai. There is also an information service for trekking and touring in the North of Thailand. We have all kinds of day tours, a variety of treks, as well as Thai cookery courses. Choose from our wide range of budget tours and trekking in the area. For sightseeing on an easy level, visit our Tours page. Here you can book tours to the Golden Triangle, Elephant Camps and Doi Inthanon National Park as well as many other places. For easy treks visit our Trekking page. And for a harder itinerary for the reasonably fit, visit our Trekking Adventures page. A popular option for those who have time is the 3 day trek. Our recommended trip is the 3 day itinerary to Phrao-Chiang Dao area. Thai Cookery Courses are another popular activity and we have these every day. Click here to see the details. You will learn how to make some of the most popular Thai dishes and be given a recipe book to take home. With hands on experience its easy to learn the basic techniques and pick up lots of tips during the course. You can also choose from our popular Chiang Mai Packages that include accommodation, tours or trek. Book your whole trip in Chiang Mai with one click. Please note priority is given to direct bookings. What's the weather like in Chiang Mai today? Copyright © 1998-2019 Sarah Guesthouse Chiang Mai All rights reserved.